Having taken three Air India economy class flights earlier this year, their legroom truly impressed me, especially on their newer A320s and 787s. Getting on Jet Airways, my knees quickly discovered that their legroom was on-par with Vueling and Iberia (who have the least pitch in Europe) – not what I was expecting. It’s advertised as being 30″, but the bulky seats made it feel more like 29″ or 28″. Jet Airways 737 Business Class. Luckily, the flight was only an hour and a half. And a cup holder, which was useful. Soon enough every seat on the 737-800 was taken, including the two next to me. At first, I couldn’t figure out why I was sweating so much. Then I saw everyone else onboard was fanning themselves as well — it must have been 80F onboard. Luckily, they closed the door on-time and we quickly departed for Mumbai. Taxiing out I noticed at least a dozen people around me were coughing, sneezing, clearing their throats and blowing their noses every few seconds. I was genuinely worried about the man in front of me, because it sounded like he was about to cough his lungs out. Unfortunately, that wasn’t all. Basic airplane etiquette seemed to have been denied boarding on my flight. The man next to me was playing video games with the sound on for the duration of the flight. Similarly, the man in front of me (who had his seat reclined from boarding to landing without a word from the flight attendants) was watching a movie without headphones. Thankfully, the meal service began quite promptly, though it took a good 45 minutes before they made it to the last few rows. There was a meat option and a vegetarian option. The veggie meal was a positive surprise! While it was incredibly spicy, the flavors were great and it blew my Air India First Class meal out of the water. I’m impressed they even served a meal on such a short, late-night flight. I tried to sleep for the remainder of the flight, but between the legroom and surrounding commotion, it was impossible. When I opened my eyes for landing, I realized the person behind me had stuck their bare foot on my armrest. It’s worth noting that the flight attendants were nice and dealt with the 10 pm departure brilliantly. Soon enough we began our descent into Mumbai and pulled into our remote gate right on time. The bus ride to the terminal lasted a good 15 minutes. At least I got the full tour of Mumbai Airport! I never thought I’d be saying this, but Air India is exponentially better than Jet Airways on domestic flights within India, in my experience. Apart from the food and relatively good service, this flight was bad. I understand that the circumstances and passengers around me played a large role in that, but either way, the aircraft was uncomfortable. Boarding Qatar Airways a few hours later was like night and day. Stay tuned! 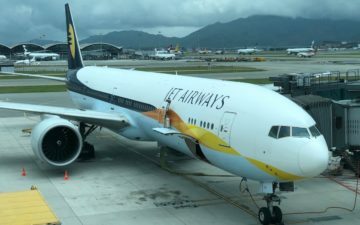 What are your thoughts on Jet Airways? How is Jet Airways and Air India even a comparison on the back of the notes you just made here. 2) not an apple to apple comparison flying in a premium cabin then comparing it with a non-premium cabin. Thanks for this. FYI, you might want to delete the 5th paragraph. It’s a repeat. I’m sorry, but you cannot judge an airline based on a single experience, and especially based on the passengers who surrounded you. So this is not a fair review. Yes, ettiquette as you are used to in the West may not exist in India (or many Asian countries), but if you cannot handle that, don’t go to India and then complain about it! There is a reason Jet Airways has tight legroom compared to Air Jndia- jet is actually interested in making a profit, and realizes that in a country where flights don’t exceed 2-2.5 hours, legroom doesn’t matter. In my experience coming from India, Jet is FAR more reliable than Air India, though in general, the low cost carriers (particularly Indigo) are the industry leaders. I would never say Air India is better than Jet, just because legroom is better. Frequency, routes, and on-time performance are far more important factors. I second that @AVS, on-time performance and general smoother operations puts Jet ahead of Air India, and I do feel like the flight was so bad for you because of the surrounding passengers (which sounds like a pretty common crowd in India and you are definitely just as likely to experience that on Air India as Jet airways). Daniel, have you or do you have plans for Jet/AI internationally? It would be great to hear your thoughts after that! I don’t think very many frequent fliers in India will agree with you that Air India is better than Jet — Air India has too many issues with massively delayed flights, disinterested staff, bad/old planes, complete lack of customer service when trying to reschedule flights or (God help you) redeem miles. 1) Totally agree with you on the leg room. It’s terrible. Vistara economy and even Indigo economy is far better. 2) They only turn their AC on after they take off, so it’s intolerable while on the ground. This reason and the previous one are why I’ve basically switched to Vistara from Jet almost completely. 3) As far as the passengers listening to music/movies without headphones, it’s happened to me a bunch of times, and I 100% agree with you that it’s totally unacceptable and just a massive lack of basic manners. But that said, in my experience, if you ask them to turn it off or put headphones on, they almost always immediately oblige. You just have to ask. And if they don’t do it once, you ask again and/or ask flight attendants to help. Agreed with AVS. I’ve flown both a fair amount over the years when visiting family still in India and Jet is *almost* always a better experience. How stupid to compare Air India 1st Class to Jet Airways economy. Did you fly air India Economy? If so how did Jet airways economy compare to air India economy? You are not comparing apples to apples. I flew Jet and had a great flight. I was in an exit row, DEL-BKK. Food was good but Air India food on my way back to India was even better in Economy that on my Jet flight and legroom was the same in their exit row. Either way your posts do not make sense because they do not compare competing products. Also, you flew on a 737, Jet Airways. This was built for domestic or short range travel. @Ryan I think you may be the stupid one, or at least the illiterate one. Which part of “Having taken three Air India economy class flights earlier this year, their legroom truly impressed me, especially on their newer A320s and 787s.” were you unable to comprehend? Seriously, if you want to troll Daniel, you are going to have to try a bit harder. Interesting review.. I flew Air India business class from Singapore to Mumbai on their 787. Service was weak, food was inedible, flight was delayed, check-in was slow, and the cabin was filthy and aging poorly. Worst of all, there was a passenger in 3a that had his seat reclined fully-flat for taxi and takeoff despite the flight crew instructions. Attitudes like AVS’ are why India will always remain a dump. Pavel while those people were being shot at in Vegas, they were thinking at least I won’t die in a dump. Not at all. But the rest of the countries are not much better than dumps either. Stop being an idiot. No one is forcing you to go India. Jet has deteriorated significantly in the domestic sector with many flights getting late. Also the politeness of their staff is better than only Air India.. Almost all other private players have better staff behavior. While this clearly is not an Apple to Apple comparison i do think that Air India offers a better inflight experience to Jet on domestic routes on their narrow body fleet. The legroom is better and food wise there is no real difference- both are mediocre although offering a hot meal on a short haul sector is in itself a plus if we compare global standards. In terms of reliability I would give Jet some plus points although not by much. The plus for Air India is that they have more Wide body services on domestic routes which are inherently way more comfortable. Within India Vistara offers a better flying experience followed by Indigo (Low cost but great service and reliability). Both beat AI and 9w hands down. You clearly have never flown Air India A320 economy. It was terrible! Seats falling apart, no entertainment, food gave me food poisoning, and the pilots went around upon arrival just because they messed up. The plane was also terrible – rivets missing from the wing and everything. Scary. I get that this is an economy review, but Vistara J is the only way to fly within India. Well spoken and well groomed flight attendants, decent food and a comfortable seat. Add to that amazing flexibility with the ticket, and by European J standards the fare is a steal. Can’t say I agree that 9W is worse than AI but I’ve not flown 9W for 10 years and AI for at least 15 years, and I’ve never flown Y in either, only F and J, still given then cleanliness and staff on AI compared to 9W I can’t say it’s likely. Go Indigo if you can–even better than 9W IMHO. Avoid AI like the plague! I agree what you all said, there are some very serious issues with aviation sector in India and which had to be to be sorted out asap, though the govt. is digging very hard to get into the obstructions with an effort to streamline the composition of hospitality in India and I am very much sure the time of change is very very nearby. 1. Due to delayed departure from Mumbai, I missed my connecting flight from Paris to Geneva scheduled in the morning. At Paris airport, there was no one from the Jet Airways team who we could speak with. Air France took no responsibility for my missed flight and I don’t expect them to. Air France still gave us compensation. The next flight to Geneva was in the evening. So basically I spent an entire day at Paris airport and missed my local sightseeing in Geneva. 2. The Jet Airways in-flight staff was rude and curt. They behaved poorly. When we asked the flight attendant (Manpreet) for water she walked right past us and did not come back. This happened twice!! A stark contrast to Air France’s flight attendants. They were so jovial and warm. Made sure we had a comfortable flight from Paris to Mumbai. 3. The least of my concern, but I’ll mention it anyway, the seating was uncomfortable and cramped up. Definitely not ideal for international travels. I am extremely disheartened by Jet Airways and their service. We love the services they provide within India but this one was a big let-down.